School Silhouette Artist Cindi Fund-raiser saves the Day! Today was not Toddlers and Tiaras, it was Toddlers and Treasured hand-cut Silhouettes by acclaimed artist, Cindi Harwood Rose, at the Kipling Street Academy for preschool children. It is hard for all educational facilities to come up with environment safe fund-raisers that are also informative, and don’t take up the parents or children’s time up selling items that may pollute the environment. Today, Cindi Harwood Rose, did 50 preschool children’s precious silhouettes for Valentine’s gifts for their parents, and donated over 25 percent of all profits to the school, including lovely picture frames. While working she entertained the children, teachers, and parents. Silhouette artist, Cindi Harwood Rose, has been doing “Silhouettes for Survivors” for over 30 years, saving the day for many schools. When interviewed, I asked Cindi Rose, what inspired her to think about sharing her gift to higher learning. She answered, that her parents told her that many things in life can come and go, but a great education is something that can’t be taken away from someone. In the US, she has done silhouettes for schools such as Grace Academy in Austin, University of Houston Moore’s School of Music, The Shepherd School of Music, Kinkaid School, St. John’s School, The Cooper School, Kipling Street Academy, St. Francis School, Highland Park, Duke, Emory U., UCLA, River Oaks Baptist School, Yale, Memorial High School, and the Awty International School. She has raised funds to sponsor complete theatre programs, by donating silhouette profits. One popular way, is for the school to line up 60 or more appointments ahead of time, from e-mail blasts, and parents spreading the word, that the world’s best silhouette artist is coming to the school. What a wonderful gift this is! Her prices are reasonable, and her signature is an investment. 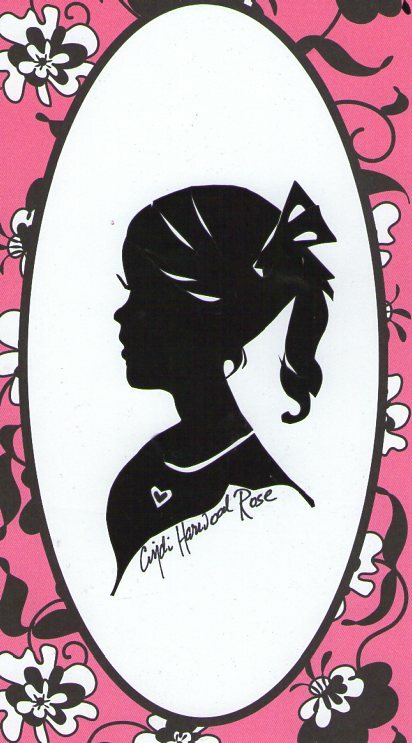 Harwood-Rose works all over the globe, and has even silhouetted many royal people in England, Scotland, and France. Of course, she has a great portfolio of celebrities she silhouetted, many are on her website. Cindi Harwood, an award winning artist, began drawing portraits at 8. By 11 people were asking to buy them, and at 16 her life changed, when she tried to cut out a profile, with scissors, freehand, without a sketch or light! She was immediately hired by a Walt Disney Company, and the first summer, the young teen, became their star artist, out producing any other silhouette artist they have ever had, or have ever had still. One day at Disneyworld, she hand-cut over 600 profiles in a day, that was in 1972! Since then, the top artist in California, has only done around 400, and surprisingly, everyone says that Cindi Harwood Rose gets the most accurate likeness and intricate details. Check her out at silhouettesbycindi.com and join her on Facebook or watch her videos on YouTube and her Silhouette Art Blog. The art of silhouetting became popular before photography, when oil paintings took weeks to finish, and were not only boring to pose for, they were extremely costly. Only the elite could afford an oil painting. The materials, all environmentally pure, were costly as well. Cobalt blue was made from cobalt. Minerals and precious stones were crushed, and mixed with flax oil or animal oils. One brilliant fine artist, came up with the idea to do a profile cutting around 500 years ago, using lamp soot to make black paper. The first “shade cuttings” were done on royalty. Later, they became popular by a French minister of Finance, Etienne de Silhouette, who could not cut silhouettes, but loved them since they cost a fraction of oil paintings, and when done correctly, they capture the soul of the person. Silhouette became the term of this heirloom profile carving when Augustin Edourt, decided that shade was not accurate, since a true silhouettest did not use a shadow. Shadows, are not accurate, so those cut off walls, or one bit clumsy, thought Edourt. When Cindi Harwood Rose works, she shares the knowledge of paper cut-out portraits, and children are drawn to her bright personality. 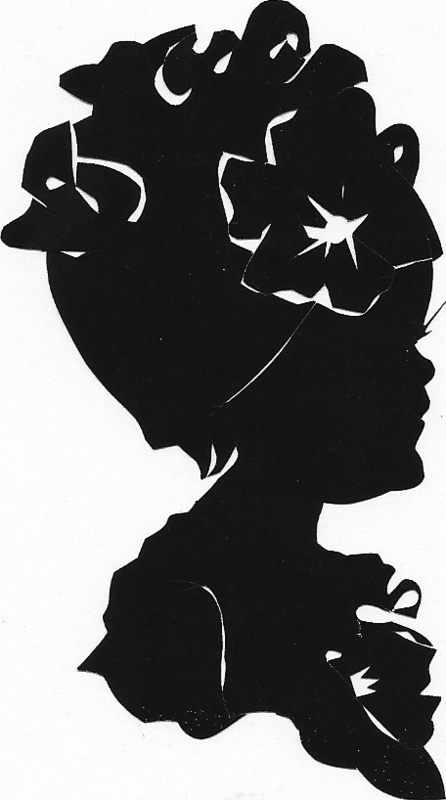 To learn the history of silhouettes, check out Peggy McClard Antiques, who also acclaims that Cindi Harwood Rose is one of the only living silhouette artists whose work is collectable. Americas premier top silhouette artist, antique silhouettes, black cut-paper portraits, black paper silhouettes, C Harwood Rose silhouettist, celebrity silhouette, celebrity silhouettes, Cindi Harwood Rose, Cindi Rose, Cindi Rose silhouettes, famous, fastest silhouette artist, fundraising event, hand-cut portraits, handcut art profiles, historical sihoeuttes, history of silhouettes, Houston, museum-quality silhouettes, old-fashioned silhouettes, paper portraits, paper profiles, premier silhouette artists, Rose Ribbon Foundation, school fundraiser, silhouette artist, silhouette artists, silhouette fund-raisers, silhouettes by Cindi, silhouettes for survivors, silhouettes in stores, timeless, Victorian silhouettes, World’s best. Bookmark. Oh this is fabulous story! Thanks so much! Cindi works so hard! I am glad the comments are working again!